NW88S FLASH N1T-S TRIGGER 12 PIECES COLOR S-TYPE BRACKET SOFTBOX BAG. Compact and portable softbox can disperse and soften light for more even balance and distribution.20 pieces color gel filters create the effect of different light colors. Visual LCD display with high definition. Consist of 48 pieces LED,higher luminance and lower static power consumption. 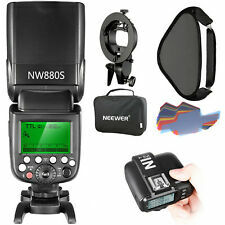 NEEWER VK750II FLASH SPEEDLITE for D3100 D3200 P7100 D300 D200 D90 D600 D80 D70. SU ITABLE FOR NIKON D5000, D3000, D3100, D3200, P7100, D7000, D700, P7000 Series,D300, D200, D90, D600, D80, D70 Series, D60, D50, D41 Series etc. Neewer Pro I-TTL Auto-Focus Flash. - Flash mode:TTL, M, MULTI, S1,S2. - Flash Diffuser. - Soft Flash Diffuser:spreads and softens the light emitted from your flash unit,bouncing off ceilings and walls, instead of coming from a single concentrated light source. Filters, box, stand and flash. 3 x 250W Strobe Flash Light. This 250W Strobe Flash Light designed for professional photographers who need to take special effect of photo, perfect for Indoor Studio Location Model Photography and Portrait Photography; NOTE: Soft Umbrella and Light Stand are not included. 1 x Macro ring head. Includes 8 Mounting Rings (49-77mm). Weight of Ring Body: 125g. Weight of Step Ring: 100g. Coiled Cord Length: Approx. Consist of 48 pieces LED, higher luminance and lower static power consumption. Perfectly Compatible with Neewer Godox Flashes. High Guide No.36(ISO 100), Full TTL Functions, Support HSS(Max.1/8000s), Front & Rear Curtain Sync. Flash Mode:TTL,M,Multi,FEC,Master,Slave,S1,S2. This TTL-compatible flash makes your recordings easier. WIDE COMPATIBILITY FOR FUJI: GN36 (ISO 100), HSS (max. Wireless Flash (2.4G radio transmission). Wireless flash function: Master, slave, off. Flash duration (t0.1): 1/350 to 1/20000 seconds. Red LED indicator will light up when the flash is ready. ). Neewer i-TTL Speedlite Flash for Nikon D7200 D7100 D7000 D5500 D5300 D5200 D5100 D3300 D3200 D3100 D500 D60 D50. Powerful Flash with High Guide No.58(ISO 100, 180mm),supports TTL/M/MULTI/S1/S2 flash mode. Ring Light continuously for macro photography. Allows for more effective lighting of subject during macro shooting. Macro Ring LED Light For Canon Nikon Sigma Lens. This LED Macro Ring Light, a well-designed device for close shots, can constantly emit light and provide permanent lighting for subjects. TT560 Flash 1 x TT560 Flash. KIT INCLUDES: (1)TT560 Flash, (1)Hard Diffuser, (12) Color Filters. Hard Diffuser 1 x Hard Diffuser. LIGHT HARD DIFFUSER: Softens the harsh flash light and diminish the shadow on your object, makes the flash light more balanced and even; Perfect for Wedding photos, portrait, outdoor events, fashion display, product display etc. It’s a specialized design for the Canon Digital Single Lens Refl­ex. It is one kind of Macro Ring light with ETTL, M and MULTI three modes. MK-14EXT Macro Ring Flash Light. 1 x MK-14EXT Macro Ring Flash Light. (1) TT560 Speedlite Flash. Powerful Manual Flash with High Guide No. 38(m). Flash Mode: M, S1, S2. 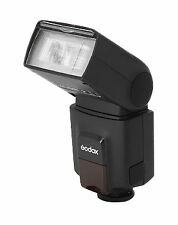 Universal foldable flash diffuser provides soft even flash illumination. Features a built-in flip down wide angle flash diffuser and reflection panel. Flash mode：TTL, M, MULTI. Contains a built-in flip down wide angle flash diffuser and reflection panel. SGA-K9 flash Accessories Kit (Barndoor/Snoot/Softbox/Honeycomb/ Disc/Diffuser). 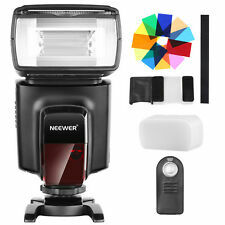 Neewer NW670 E-TTL Flash for Canon EOS 700D 650D 600D 1100D 550D 500D 100D 6D . FLASH SPEEDLITE: High Guide No.36 (ISO 100), Full TTL Functions, Support HSS(Max.1/8000s), Front & Rear Curtain Sync,wireless ID setting. Wireless Flash(2.4G transmission) Wireless flash function: Master,Slave,Off. 1x NW580 Flash Speedlite. 1x Trigger Transmitter. Wireless Frequency: 2.4G. Flash Mode: M, Multi, RX Slave, S1, S2. Flash Duration :1/200s-1/20000s. Neewer Aluminium Alloy Conical Snoot Kit with Honeycomb Grid and 5 Pieces Color Gel Filters for Canon Nikon TT560 NW561 NW562 NW565 NW620 NW630 NW680 NW670 750II NW910 NW880 Flash Speedlites. SNOOT FUNCTION: Help you concentrate the light in a small area and pinpoint the product details, Using a snoot is especially ideal for portrait and product photography. Powerful Flash with High Guide No.58(ISO 100, 180mm),supports TTL,M,S1/S2,Multi flash mode;. Flash mode:TTL,M,FEB,S1/S2,Multi. Kit include:(2)NW-562N Flash (1)2.4Ghz Wireless Trigger(1 Transmitter 2 Receiver). 1x NW630 Flash Speedlite for Sony. 1x S-type Flash Speedlite Bracket Mount. Wireless Flash: 2.4G Transmission. Wireless Flash Function: Master,Slave,Off. Wireless Flash Trigger Swinging/Tilting Flash Head(Bounce Flash):0 to 180 Degrees Horizontally,-7 to 90 Degrees Vertically. 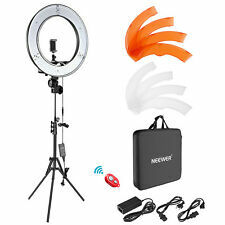 Neewer TT560 Flash Speedlite Kit includes TT560,Light Stands,Kit Bag,Reflector. (3)TT560 Speedlite Mini Stand. Neewer 71"/180cm Photography Light Stands is both for studio and on-site use. Powerful Flash with Guide Number 38(m ISO 100 ); Flash Mode: M, S1, S2. Powerful Flash with High Guide No.58(ISO 100, 180mm),supports TTL,M,S1/S2,Multi flash mode;. Flash mode:TTL,M,FEB,S1/S2,Multi. NW-562N i-TTL Flash. Flash Coverage:18-180mm. FC-16 2.4G wireless flash trigger. The adapter can help the mirror be mounted on the ring light. With 180 degree swivel design, this mirror would be a good choice for the make-up favorites or using LED ring light. Note: Ring light and light stand are not included. Kit includes: (2)NW620 Flash, (1)2.4Ghz Wireless Trigger(1xTransmitter, 2xReceiver), (2)Hard Diffuser, (1)N1/N3 Shutter Cable for Nikon. NW620 Manual Flash. 2 x NW620 Manual Flash. The wireless trigger: S1/S2 induction flash. 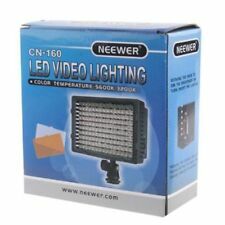 1x Neewer E-TTL TFT Color Display Speedlite for Canon. Use in slave mode with a highly sensitive wireless triggering sensor. Large size TFT color display. S1,S2 light flashing mode. Contains a built-in flip down wide angle flash diffuser and reflection panel. 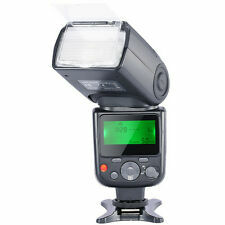 Neewer Speedlite 750II TTL Flash for Nikon - Complete Package - Mint Condition!